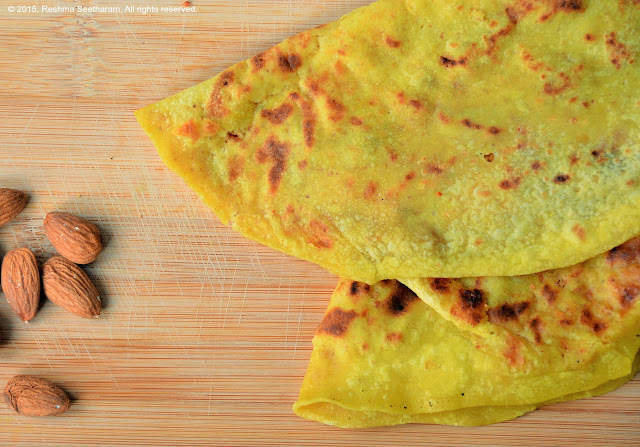 Naan is wholesome, yummy flat-bread made from risen dough. You can make them using yeast or yogurt. 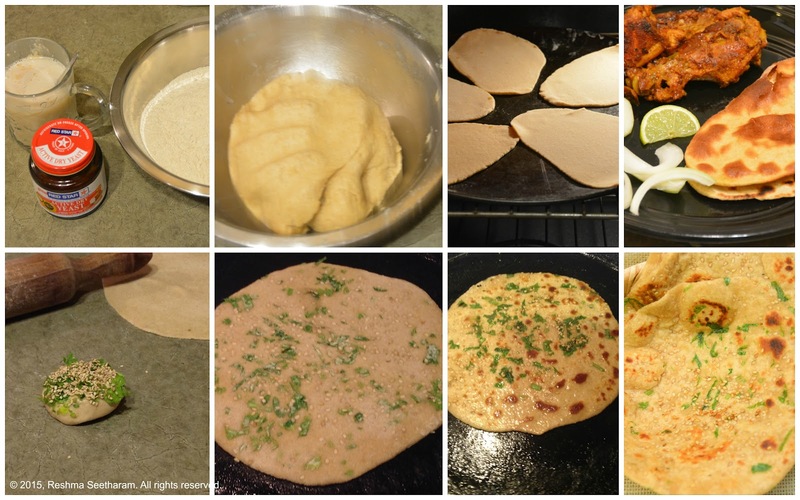 You can cook them in an oven/tandoor or a stove-top griddle ; it will taste just as good! The dough can be made two ways. You may use baking soda and yogurt, or use yeast. Both methods are given below. Mix yogurt, baking soda, powder, salt and sugar. Whisk and set aside. In a large bowl, mix flour and the yogurt mixture to form a dough. If the mixture requires more liquid, add some warm water. Smear a little oil over the dough and cover with a damp cloth; Set aside in a warm place for an hour. The dough would have risen considerably. Punch it down and knead well. Divide the dough into 16 portions. Make balls; cover with a napkin and set aside to rest for another 30 minutes. Lightly tap down the dough balls. The dough is ready to be rolled. Dissolve sugar and yeast in the warm water and set aside for 10 to 5 minutes in a warm place. In a mixing bowl add flour, salt and melted butter. Mix well. Add the frothy yeast mixture to form a dough. Add more water if needed. Smear melted butter over the dough and let it rest in the bowl, covered with a damp cloth or napkin. Let it rest for a good two hours. This will depend on the atmospheric temperature. If you live in a tropical, warm climate, two hours should be good. Here in rainy cold Seattle it took me 3 hours for the dough to double in size. Punch it down and knead well. Divide the dough into 16 portions. Make balls; cover with a napkin and set aside to rest for another 30 minutes. Lightly tap down the dough balls. The dough is ready to be rolled. Get two shallow cups/plates. Fill garlic and cilantro in one, and sesame seeds in the other. Dust the rolling surface with a generous amount of flour. Now, dip a dough ball in sesame seeds, then press down into the garlic cilantro plate. 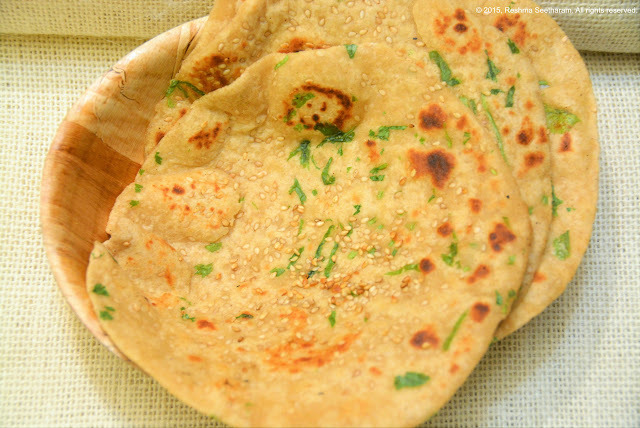 Once they stick to the dough, dust it with flour and roll out lightly to form a flat bread about 5 inches in diameter. You may roll them out into circular or oblong shapes, tapering at one end. They are now ready to go on a stove-top pan or oven to cook. Cooking naan, can be done two ways, in a hot oven/tandoor or on the stove top. Preheat the oven to 400 degree F. Place the naans on a tray. You may now place them in the oven at 400 degree F for 7 to 9 minutes. Remove it when it is puffy and brown spots appear. 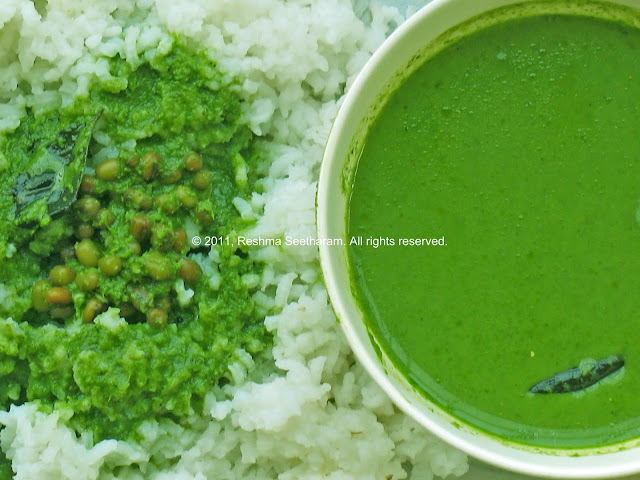 Brush them with melted butter and serve with a warm curry. Heat a cast iron or non stick griddle. When it begins to smoke, place the rolled out naan on the griddle, with the garlic and sesame side face down. When you large bubbles, flip. Continue to cook the same way on the other side. Brush them with melted butter and serve with a warm curry. Personally I like both ways. 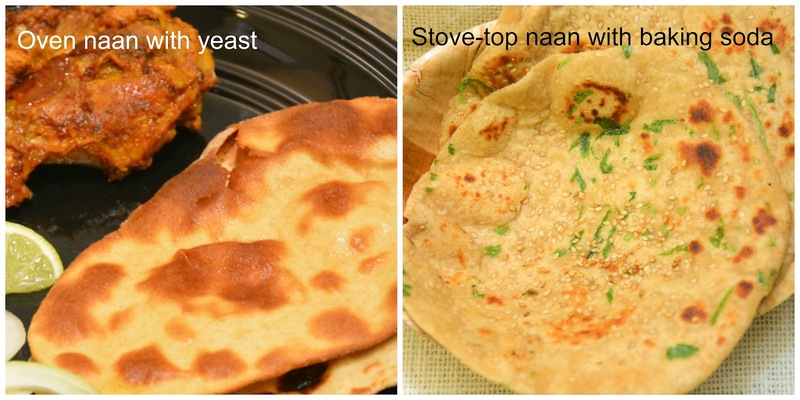 Pictures of naans made in the oven and stove-top are below. Enjoy!